Four-color process printed on Side 1 of uncoated 100lb Smooth White stock. 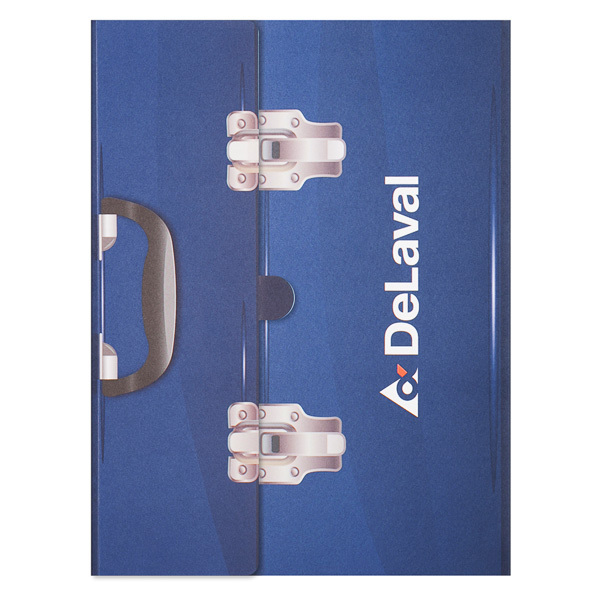 Made to look like a toolbox, this design lets dairy farmers know that DeLaval offers solutions for their most common production and animal welfare quandaries. Its blue panels are reassuring, yet also look professional. Blue pockets create consistent color branding inside and out; the brand logo also reappears on the left pocket. DeLaval's URL is on the back panel, where it's easy to find yet doesn't distract from the overall design. Four-color process printed on Side 1 of uncoated 80lb White Smooth stock. H1 business card slits on right pocket. 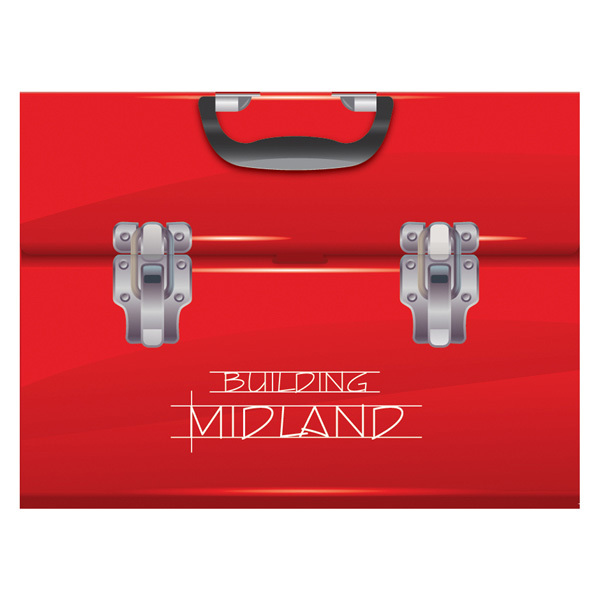 This design for the City of Midland plays on the city's "Building Midland" slogan with a printed handle and locks to make it look just like a toolbox. The slogan itself appears in a handwritten typeface between lines like those on a builder's blueprints. The folder even opens like a toolbox when users unlatch the tab in the center of the gatefold design, between the two locks. The center and right interior pockets continue the vibrant red color scheme while providing information about the city, whose council members appear in a full-color image on the center pocket to let recipients see just who is building Midland. Four-color process printed on Side 1 of 130lb C2S Dull stock. Coated with Aqueous Satin. H4 business card slits on left pocket, with V1 business card slits on right pocket. Clean lines and neutral colors set a modern tone for real estate law firm Sciocchetti & Abbott. Curvy, wide-spaced sans serif lettering on the flap adds to the minimal style. Burgundy accents warm the cool gray and white panels, making the design more welcoming. The house wraps from the front cover onto the back to add visual interest. Four-color process printed on both sides of 12pt C2S White Semi-Gloss stock. Coated with Aqueous Gloss. H4 business card slits on left pocket. Cover photos showcase New Yorkers enjoying some of the social and community activities provided by the New York City Housing Authority. 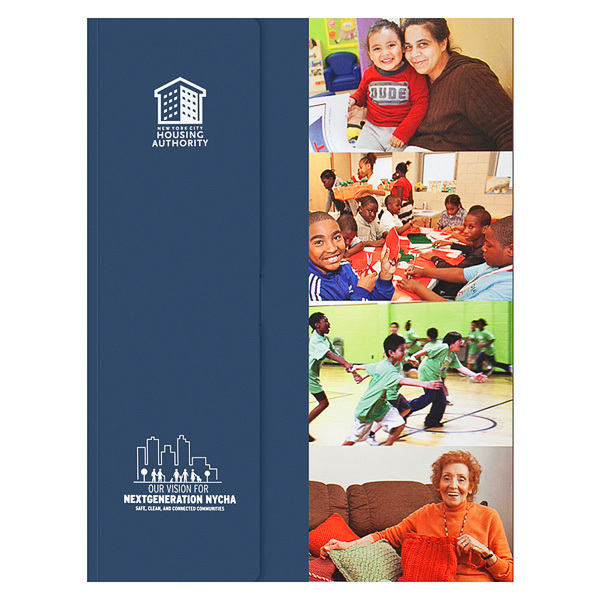 The flap at left houses the NYCHA's current and "NextGeneration" logos. On opening the cover, recipients can read the agency's mission or connect on social media. The dark blue panels use the NextGeneration logo to remind readers of new or upcoming goals. 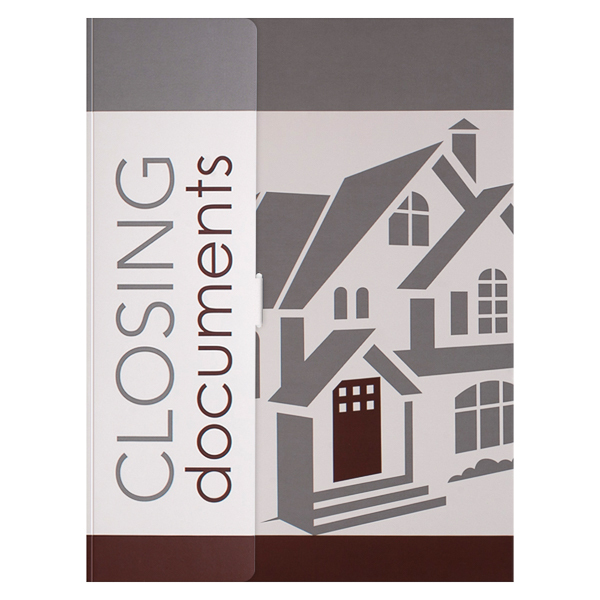 With its 3/16" backbone, the flap wraps around both panels and acts as part of the front cover using a tuck tab mechanism. This guarantees the product stays closed, so 8 1/2" x 11" print materials won't slip, slide, or spill out of the two interior pockets. The tuck tab also requires users to interact with the hands-on cover. Turn the flap's exterior into a design that wraps around the product for a continuous viewing experience, or imprint its interior as an info panel to tell customers more about your brand.